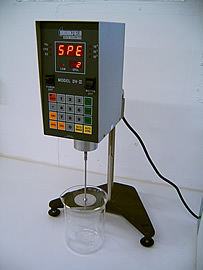 A choice of Brookfield viscometers are available for simple, shear viscosity testing or measurements to historical standards (such as are prevalent within the paint / ink industries, adhesives & medical sectors). 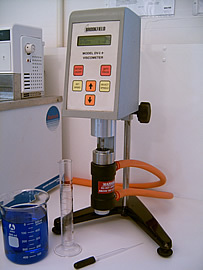 Gammadot owns a 5xHBTDV-II digital viscometer (ultra high viscosity), RVDV-I+ digital viscometer (medium viscosity) and a LVDV-I+ digital viscometer (low viscosity). 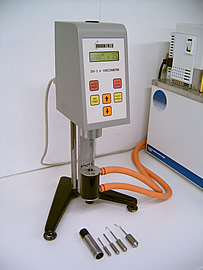 Along side the full standard RV and LV spindle sets, a UL Adaptor (Ultra Low Viscosity) coaxial cylinder system, S.S.A (small sample adapter) & standard hot melt coaxial cylinder arrangements with water heated jackets can also be used in conjunction with these viscometers providing the facility to derive accurate isothermal measurements of shear viscosity as a function of shear rate across a temperature range of ambient to ambient to 100°C.